Chromatography is not a subject to set pulses racing. As a staple technique of the analytical laboratory that is over 100 years old, it may be effective at separating complex mixtures into their constituent parts, but you may not think it is at the cutting edge of scientific technology. You would be wrong. For analytical scientists are hard at work applying highly advanced materials to chromatography, including carbon nanotubes and metal-organic frameworks (MOFs), as well as some rather unexpected materials, such as fizzy water and ice. The result should be a new generation of chromatography that is greener, more effective and full of cutting-edge chemistry. In chromatography, the constituent parts of gaseous or liquid samples are separated by passing them through a long column. These parts, or analytes, can be molecules, particles or biomolecules, such as proteins or peptides. The samples are carried through the column by a mobile phase – a gas or liquid – and the columns contain a stationary phase, which can be liquid or solid. If the mixture and mobile phase are gases then the technique is known as gas chromatography; if they are liquids, liquid chromatography. The idea is that, as the sample passes through the column, its constituent analytes stick to the stationary phase, with some analytes attaching more firmly than others. As the mobile phase then flows through the column, it washes the analytes out of the column at varying times, depending on the strength of the attachment: weakly attached analytes appear earlier than strongly attached analytes. In this way, the analytes in a sample are separated, with each leaving the column at a slightly different time. Exactly how well this separation works depends on interactions between the analytes and the mobile and stationary phases, making the choice of mobile phase and stationary phase very important. For the mobile phase, analytical scientists are limited to various mixtures of gases or liquids, although the choice is extensive. The stationary phase, however, offers much more scope for chemical creativity. 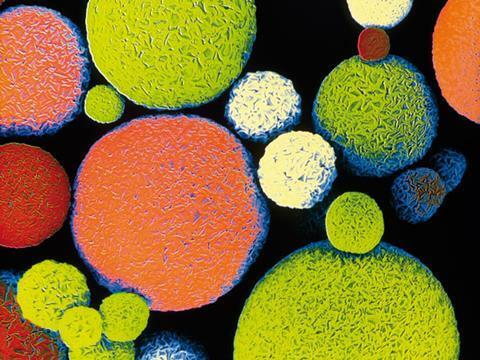 At the moment, most chromatography stationary phases consist of a packed column full of microscopic porous particles, usually 3–10µm in diameter and made from silica. In liquid chromatography and some forms of gas chromatography, the analytes bind directly to these particles, often via hydrogen bonds. In other forms of gas chromatography, the stationary phase particles are covered in a thin layer of liquid, in which the analytes dissolve. There are several alternatives to particle-based stationary phases. For gas chromatography, there is the open tubular format, in which the stationary phase is a stable layer of liquid, often an organic solvent, coating the inside of the empty column. For liquid chromatography, there is the monolith, in which the column is filled with a solid piece of porous material, like a rigid sponge. So analytical scientists already have quite a range of stationary phases to choose from, especially as the specific binding abilities of many of these can be finely tuned by chemical modification. For example, attaching negatively charged chemical groups to silica particles or monoliths enhances their ability to bind positively charged analytes. But analytical scientists are always on the lookout for new and improved stationary phases. One obvious way to improve a stationary phase is to increase its resolution, meaning the number of analytes it can separate clearly, and its separation speed. In the past, this has been done by reducing the size of the silica particles, leading to high performance liquid chromatography (HPLC). Nevertheless, even modern chromatography systems can struggle with really complex samples containing thousands of different analytes, as is often the case with biological and petroleum samples. Furthermore, ongoing efforts to shrink chromatography systems to the size of single microchips adds to the demand for stationary phases with ever higher resolutions to separate analytes over tiny distances. The main reason that smaller particles give better resolution is because they offer a large surface area for binding analytes. But nanoparticles are not the only materials with a large surface area, which explains why Xiu-Ping Yan and his colleagues at Nankai University in China are looking at MOFs. These are three-dimensional, crystalline substances in which metal-based molecules, acting as ‘joints’, are linked together by long, rigid organic ‘struts’. This produces a regular structure that resembles scaffolding, with huge pores that create an enormous surface area. MOFs are easy to produce, self-assembling from mixtures of metal oxides and organic groups, and are being explored for various applications, including gas storage, catalysis and drug delivery. Conventional gas and liquid chromatography tend to require lots of expensive and occasionally toxic materials and chemicals, including organic solvents. Thus efforts are underway to reduce the need for these materials and chemicals and shrinking the systems is only one way to do this. Another is to replace the toxic and expensive materials with cheap and non-toxic materials – and what could be cheaper and less toxic than water? This was the thinking behind a new form of open tubular gas chromatography developed by Kevin Thurbide at the University of Calgary, Canada, in which the organic solvent stationary phase is replaced by fizzy water.3 In a neat bit of symmetry, the stationary phase actually consists of water saturated with carbon dioxide, while the mobile phase consists of carbon dioxide saturated with water. Thurbide came up with this novel technique when investigating another green version of chromatography known as subcritical water chromatography, which uses liquid water at high temperatures and pressures as the mobile phase. He found that adding carbon dioxide to the water greatly increased its ability to release analytes from a particle-based stationary phase, reducing the need for high temperatures. Next, he discovered that analytes could still be separated, even when the stationary phase particles were removed from the column. The water in the mobile phase was forming a stable film on the walls of the column and the analytes were then dissolving in this film. Developing this approach, Thurbide came up with the version in which mixtures of carbon dioxide and water form both the mobile and stationary phases. After showing that this fizzy version of chromatography could separate a specially-prepared mixture of five different alcohols, Thurbide successfully used it to separate ethanol from the other constituents of whiskey, wine and gasoline. He also did the same for the caffeine in a cup of coffee and an energy drink. As well as being greener than conventional forms of chromatography, this fizzy chromatography has several other advantages. ‘One aspect is that it is rechargeable, and so if the column is “fouled” by a particularly dirty sample or series of dirty samples, the column can be flushed and re-established for fresh usage again,’ explains Thurbide. He is now working on enhancing the efficiency of the technique, and envisages it being used to analyse petroleum-based fuels, especially given its easy-clean facility. Water is also the stationary phase material of choice for Tetsuo Okada at the Tokyo Institute of Technology in Japan, but this time as ice. In line with conventional chromatography, the ice is in the form of microscopic particles, around 6µm in diameter, that fill the column. Okada produces these ice particles by spraying tiny water droplets generated by an ultrasonic humidifier into liquid nitrogen. One of the great advantages of using ice as a stationary phase is that it is highly flexible and adaptable. For a start, it offers two different separation mechanisms, depending on the temperature. Below 5°C, analytes bind directly to the surface of the ice particles via hydrogen bonds; above 5°C, a layer of water forms on the surface of the particles as they begin to melt, allowing analytes to dissolve into this layer. This means that the separation process can be finely controlled, in terms of which analytes elute when, merely by changing the temperature. But that is just the beginning, because the ice can easily be modified to give it a much wider range of properties. Whereas modifying silica particles and monoliths involves chemical reactions, which can be complex and time-consuming, modifying the ice particles simply involves adding compounds to the water prior to freezing. The obvious disadvantage of ice stationary phases is that they tend to melt if not kept at low temperatures. But Okada is now trying to make them more robust by supporting the ice particles in porous materials. Water is not the only option for greener stationary phases. Ionic liquids are salts that are liquid at room temperature, consisting entirely of anions and cations, and have found a wide variety of uses, including digesting plant biomass and processing nuclear waste. They can also replace organic solvents as a liquid stationary phase in gas chromatography. Ionic liquids offer a number of important advantages as a stationary phase: they are non-toxic, remain in a liquid state over a wide range of temperatures, and are resistant to damage by moisture and oxygen. In addition, they are able to attract analytes via a variety of different mechanisms, including ion-exchange interactions, hydrogen bonding and hydrophobic interactions. The first commercially-available ionic liquid gas chromatography columns have now started to appear from companies such as Sigma–Aldrich. 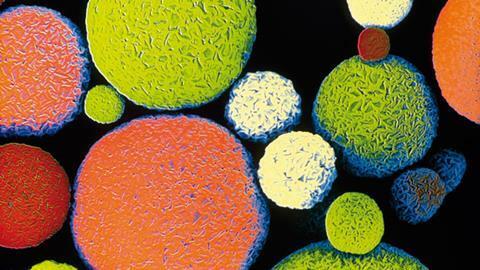 These are polymer particles that have been synthesised around some kind of template molecule. When the template molecule is removed, it leaves behind an imprint in the polymer particle, like pressing a key into soft clay. Only the template molecule, or molecules with a similar structure, can fit into this imprint, so the MIPs will preferentially bind with the template molecule. Using free-radical polymerisation and ferulic acid as the template molecule, Row transformed the ionic liquid 1-allyl-3-ethylimidazolium bromide into MIPs, and showed that they could separate ferulic acid and two related phenolic acids from a sample of a medicinal herb. ‘When molecular imprinting technology was involved, the selectivity of the [ionic liquid] stationary phase increased,’ says Row. He and his team are now developing MIP-based stationary phases for various other analytes. Many of these cutting-edge stationary phases could soon be entering the mainstream. Thurbide and Yan have both had discussions with companies about commercialising their stationary phases, while Okada hopes that combining his ice stationary phase with a porous material should also lead to its commercialisation. This could, eventually, lead to pulses in analytical laboratories starting to beat a little faster.